Manchester United to finally seal the deal for Juan Cuadrado Manchester United have finally set their eyes on Serie A star attacker Juan Cuadrado according to DailyStar. Manchester United have finally set their eyes on Serie A star attacker Juan Cuadrado, according to DailyStar. The Colombian has been n link with the Red Devils since the summer after his impressive performances in the World Cup for Colombia. United who kept their third place yesterday by beating Liverpool in the Premier League are not the only side interested in his services. 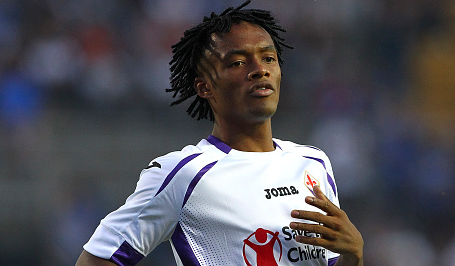 Reports have also revealed that Manchester City are also targeting Cuadrado. United have been link with former star Nemanja Vidic, Roma midfielder Kevin Strootman and Bayern Munich star winger Arjen Robben so far for the January window. Boss Louis van Gaal sent a scout in the last week Europa league game of Fiorentina to watch Cuadrado game as per the reports. Fiorentina boss Montella was not happy with his player and added after the game that his mind was not on the pitch that’s why he substitute him. The 26-year-old who was the top assist provider in the World Cup has a worth around 30 million pounds. The Serie A star is also planning to accept a new Premier League challenge. He also has a dream of playing Champions League football. Fiorentina are currently on eight spot, three points behind the Champions League place. Cuadrado has four goals to his name so far this season in 17 appearances in all competitions.